Reserved for Anzac Day at pubs and RSLs around Australia and New Zealand, Two-Up is a much loved and patriotic game. While it’s specifically linked to mark Anzac Day festivities, some punters love this classic game so much that we’re often asked if Two-Up is available to play at online casinos. Unfortunately you won’t find Two-Up at any of our recommended Internet gambling venues, but we’ll explain the game so you’ll be all set if it ever is added to any of the game catalogues. Two-Up is a customary Australian gambling game with a deep seeded history in Aussie culture. A very simplistic game, it remains a significant part of our culture today due to its strong link with the soldiers of World War I, where it was played extensively to help pass the time between battles. Going back even further, it’s predicted that Two-Up arose all the way back in the convict era and spread even further during the gold rush era of the 1850’s. The game is played when a “spinner” tosses two coins simultaneously into the air, with punters placing bets on whether the coins will land both tails up, both heads up, or one heads and one tails up. Two heads is known as an ‘obverse’ bet, two tails is known as a ‘reverse’ bet and one of each is an ‘odds’ bet. 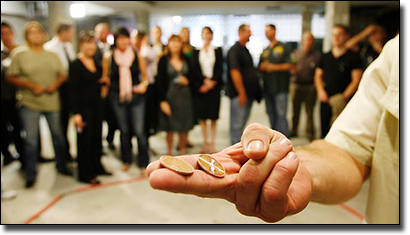 The game starts when a spinner is selected, who then comes before the crowd and places both coins onto a flat piece of wood known as a kip. The spinner must make a bet before they throw the coins, with one other player equally matching the bet. All other players place side bets against each other as to whether the spinner will win or lose. If the spinner wins, they keep their initial bet. If the spinner loses, the wager goes to the player who matched the bet. The same spinner continues to orchestrate the throws until they win or lose a bet, and eventually every player in the group will take the position of spinner. Each game of Two-Up is overseen by a person known as the “boxer” who manages the game and the betting, without participating in the game itself. Two-Up is not currently available at any of our recommended online casinos and we’re not exactly sure whether this may change in the future. While Two-Up could make a pretty fun online game, half the beauty of Two-Up is the social atmosphere, with the main fun factor coming from the group mentality and bonding nature of the game. Gaming developers definitely have the potential to craft some pretty cool software for a virtual Two-Up game, but whether or not it would have the right effect is yet to be determined. There is no other casino game quite like Two-Up, but for players who enjoy games of chance, we recommend you try roulette or some of the mini casino games available like keno or virtual scratch cards. G’Day Casino also offers a fun chance-based dice game called Sharp Shooter, which you’ll find listed under the table games category.